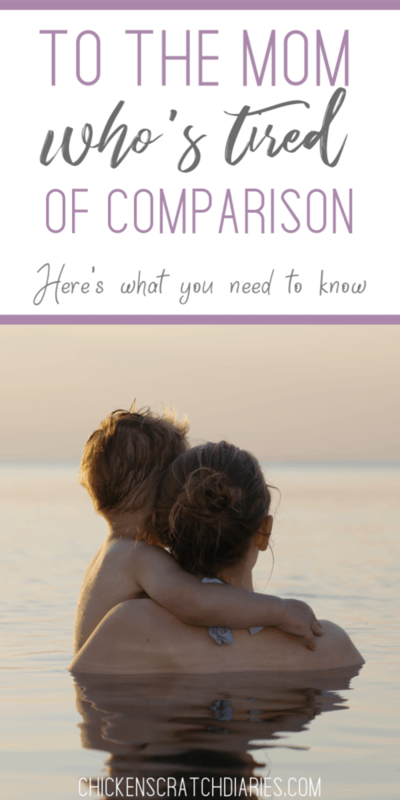 Do you suffer from comparison fatigue? You may already be nodding your head at that statement, but let me explain. I’m talking about the bad habit that we have as moms — as women — to unfairly compare ourselves to others. It’s exhausting! I’ve been thinking a lot about how I view myself as a mom and as a person in general. I strive to teach my kids that our value comes from who we are in Christ — not by any measure that others can assign to us. *This article was originally published at Her View From Home. This is an important truth, especially as I’m raising young girls and I’m ever-conscious of their impressionable hearts. The culture is a dangerous place to find our worth. There has to be a better standard. But in order to be this example to my kids and others around me, I find myself having to continually keep my own worth in check. Right now, knee-deep in the midst of motherhood, I have days (ok, weeks… months even) where I just don’t feel like I know what I’m doing! I start to wonder if God really knew what He was doing when He knitted me together with all my quirks and insecurities. And those insecurities, I believe, are what leads to the comparison game: the need we feel to mentally position ourselves next to, or above others in some way, in order to minimize our perceived flaws. You would think that the female competition that seems to start in preschool, gains traction in Middle School and is in full force even in the workplace would somehow evade motherhood. To be united in such a noble calling, there *should* be an unwritten rule that we must band together and cheer each other on as mothers, as we trudge this path together. But we’re all guilty. 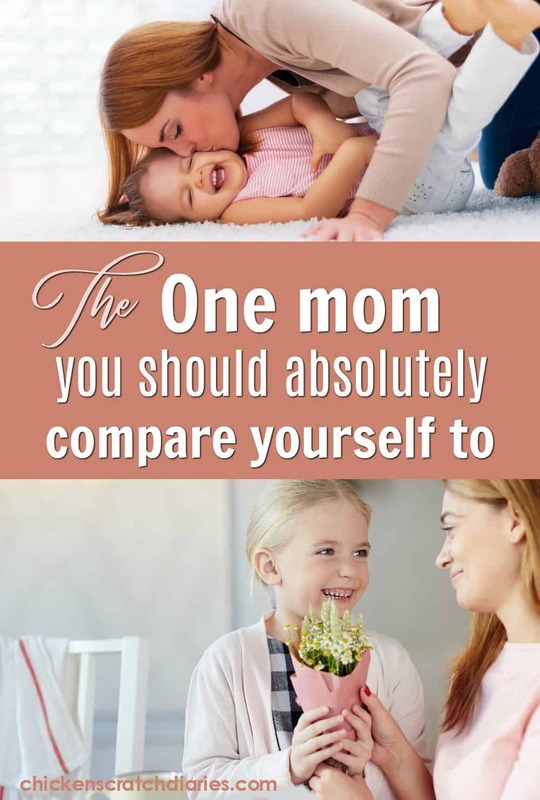 And somehow, this tendency we have as women to compare ourselves to others infiltrates all aspects of our lives, and our “mom life” is no exception. In the social media age it’s especially easy to feed this habit, without even realizing it. I find myself tempted by comparison more often than I’d like to admit. Especially when I’m in a vulnerable spot, like when I’ve had a particularly off-kilter day with my little ones and I’m running on little sleep and even less patience. Inadvertently, instead of looking up, I find myself surfing Facebook, wishing I could measure up. Have you been there, mama? Scrolling through your social channels, absently wondering whose toddler is meeting their developmental milestones and whether yours is ahead or behind. Do you find yourself wondering how your neighbor appears to have a picture-perfect marriage while yours might be drowning in the slow sludge of parenthood? Do you see that “hot mess mom” and wish you at least had a trendy title for the chaos that trademarks your parenting style? According to Instagram, everyone else has “it” all together, with a picture and a perfectly corresponding quote to prove it. So what’s wrong with us? Why do we struggle so much when other moms seem to take it all in stride? The truth that often escapes us, as we all know but frequently need to be reminded of it, is this: our friends, as much as we love them, sometimes make lousy reporters. Their insecurities, shortcomings and flat-out failures, though they may be of a different variety than ours–they still exist on the other side of the screen. We know this, don’t we? Yet, we can’t help it. We’ve been trained our whole lives to compare. In my estimation, there is one mom (just one) that we should use as a measuring stick against everything we hold sacred. There is just one mom we should absolutely compare ourselves to in every way, and we should always care about her opinion first and foremost. You guessed it: that mom is ourselves. How we judge our own successes and failures, how we learn and grow and adapt throughout our mothering journey–that’s for us to decide. Our mile markers might look different than the next mom’s, but the faithful steps we take along the way–they are well-plotted and directed for us alone. Our Maker who graciously gifted us with these children, who first belong to Him–He knows what He’s doing! We are rightfully equipped for this critical task of motherhood, friends, just as we are. Carefully chosen. Uniquely molded. Perfectly appointed. We are not called to conform to anyone else’s standard of perfection (or even our own). Just being us, working on us and focusing above us–that’s all we need. There will never be another person who can do exactly what God has called us to do and be who He designed us to be–whether it’s in this season of life or any other. For this unique role, there is no comparison. Lately when I’ve been frustrated or feel like I’m failing or feel unmotivated I’ve been thinking of the Proverbs woman! It’s been really helpful and encouraging actually. That woman is my hero. 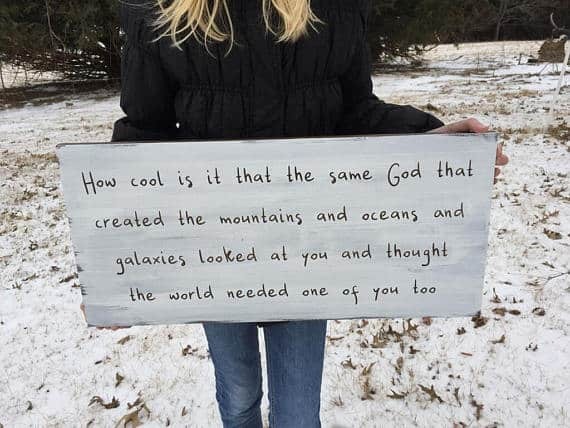 🙂 It’s all about perspective, isn’t it? Thanks for stopping by Holly!